The day after coming back from Amsterdam, I was fortunate enough to meet author Pete Jordan at a book reading for his new book In the City of Bikes, a book about bicycling in Amsterdam. He’s an American who went to Amsterdam over a decade ago to study urban development and instantly fell in love with the city and their bicycling culture. So he expatriated there. It was perfect timing for me to hear about his new book on bicycling in Amsterdam since I just took a trip there and there were a couple of things that I observed that I didn’t understand. Also, I wanted to learn what made Amsterdam the world’s friendliest city for people on bikes. It just boggles my mind that cycling is so prevalent in Amsterdam (and a few other cities) but everywhere else in the world is pretty much dominated by automobiles. While my experience was still fresh in my mind, the book answered my questions and in a wonderful way, it extended my vacation psychologically. 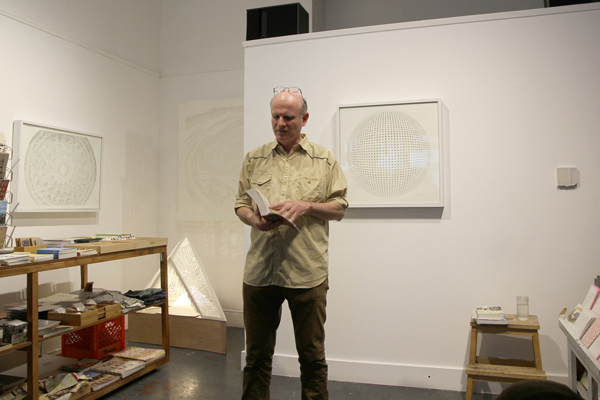 Pete Jordan, the author of ‘In the City of Bikes’ at a book reading in San Francisco. 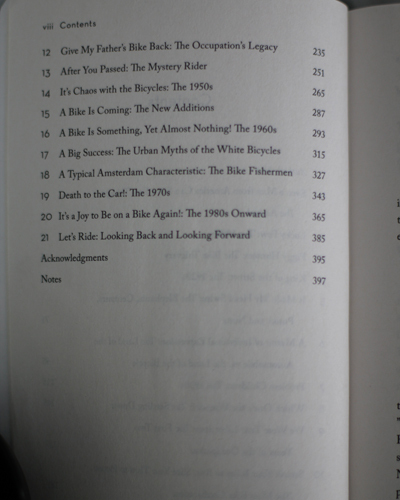 As you can see from the table of contents, there’s over a hundred years (started from the 1890s) worth of bicycle history in Amsterdam. The book has in-depth quotations, facts, and details for almost every important decade chronologically. In the City of Bikes also reads like a personal memoir which I really enjoyed reading. One example is when his wife, Amy Joy becomes a bicycle mechanic and subsequently starts a bike shop. Another example is the bonding between father and son when his son Ferris sits in front of him on a bicycle playing the game Which Way?. 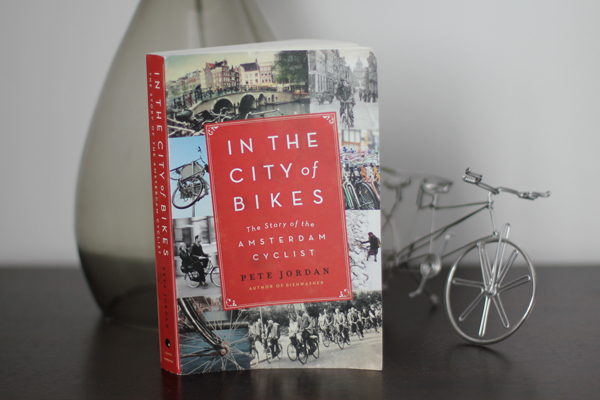 Mostly, the book speaks about the rich historical culture of bicycles in Amsterdam and it’s engaging. Amsterdammers had fought for their ways against anti-cyclists, Nazi occupation and confiscation of their bikes, and rampant thievery. Through it all, they still tried to implement the White Bicycles Plan in the 1960s which has inspired today’s bike-share programs around the world just as much as their utopian bicycle infrastructure. The author also covers the story about the famous and controversial Rijksmuseum bike passageway which was recently reopened to cyclists after a decade of closure and was breaking news in the city. If you are interested in cycling and Amsterdam cycling, both historically and culturally, then this book is for you! 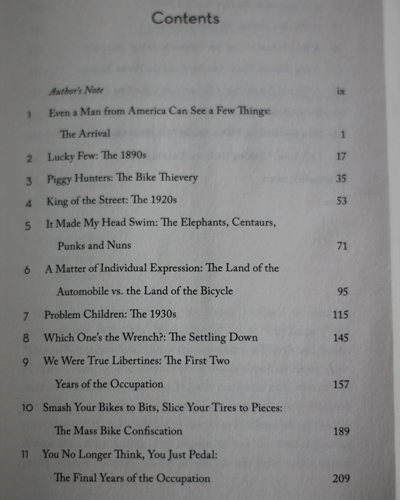 One thing I would like the author to elaborate a little more on is to have more emphasis on his personal experience as an American foreigner moving to Amsterdam for the bicycle culture and also so I can relate even more closely to his passion for bicycling. Perhaps he’s saving it for his next book? I hope so. Pete Jordan is also the author of the memoir Dishwasher: One Man’s Quest to Wash Dishes in All Fifty States. HarperCollins Publishers, 2013, $15.99 USD.